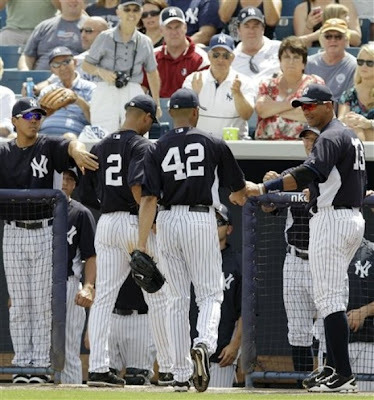 "Mariano Rivera is one of the Yankees and, in so many ways, he stands apart. This has nothing to do with his potential retirement, because this has been going on for years now. This is about his regal standing even within a clubhouse filled with kingly prices. There are other stars. Other Hall of Famers in waiting. Others of historic achievement. But there is just one Rivera, whose brew of greatness, humility, humanity, durability, poise and confidence allows him to be looked upon by teammates the way fans look upon them. They feel honored to share the same clubhouse and uniform, blessed to play with him. They are not offended that a few special rules apply only to Rivera. Actually, they wonder why there are not more. This is the spell he casts, the Yoda-esque aura of the man. And, if anything, Rivera departed his first game of spring yesterday having added yet more elements to his shock-and-awe history. It is not just that he went 1-2-3 against the Phillies. It is that on the Yankees’ radar gun he threw his first pitch 91 mph and his 14th and final one the same speed, never dipping below 90 in between. That is not only faster than most of Michael Pineda’s pitches in his first outing, but already is what Rivera was throwing at the end of last season. When he was 41. He is 42 now. Of course if this were just about velocity, Rivera would receive a stuffed animal as a prize, not relentless admiration. But on March 11, 2012 — five months after his last game action — Rivera also was hitting spots on both sides of the plate. His ball was still making that late five-inch veer that turns hittable fastballs into optical-illusion cutters. So he was Mariano Rivera, which at this point is a statement of definitive greatness. wouldn’t he just say he will be playing next year? On this day, “just Mo” threw 14 more pitches in the 90s when he is in his 40s, threw them with a break that Martin described as “late, precise and great,” threw them into the memory banks of teammates who are among the best in the world, yet see their closer as something above that."